The broadcast TV industry has endured many technological changes. The move to IP is but the latest challenge for engineers. Image: YouTube. Broadcasters now find themselves on one side of a digital gap. On one side we have SDI, the other side IP. Engineers want to reach the far shore, but do so without sacrificing their investment in current SDI solutions. This article reviews some of the key concerns engineers may face when migrating from SDI to IP. We’ve been here before. Transitioning to new technology solutions is nothing new. Any engineer or technical manager over the age of 40 has encountered the issues of moving from analog to digital, from MPEG1 and through the following versions and from SD to HD. Depending on where you worked, there may be other conversions you endured. One common element is that significant technological change require generational developments. Sometimes those changes are backwards compatible, but not always. Thus lies the key issue for us moving from a comfortable SDI environment to a less-familiar, IP setting. The early adopters of IP are looking at their new and exciting infrastructure and wondering what’s going to happen when the new edge devices like cameras and production switchers begin using ST-2110. Plus what about all the capture and production devices that will need to be cross compatible to SDI, ASPEN, and soon ST-2110. Technology adoption model. 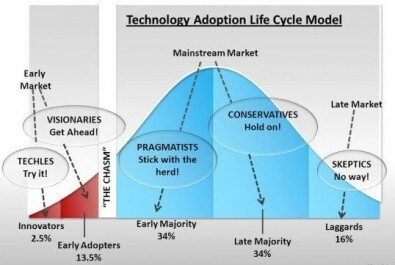 Crossing the chasm is closely related to the five-segment technology adoption life cycle. The most difficult step is making the transition between early adopters and early majority. The chasm can be successfully crossed by an industry if the solution (standard) creates a significant and sufficient effect in the marketplace of users and vendors. Shivayogi Kumbar, Medium. One of my engineering friends recently deployed a substantial amount of Evertz IPX then upgraded to the facility’s core infrastructure to ASPEN. The work required careful thought on how to properly integrate the two formats and the needed edge devices. After all the work was completed, a senior colleague of his informed him that the next studio upgrade would be all ST-2110. While the industry consensus is to adopt ST-2110, this engineer may rightly be anxious about how his earlier investments may properly integrate with ST-2110. One suggestion is to upgrade his entire system with the statement that “It will only be a firmware/software upgrade!” I would be happy to take a poll of all the engineers who are willing to do a major software upgrade to their entire infrastructure without a safety net. It is more likely that this engineer will keep his current infrastructure as is and later work with the original vendors to get whatever software or hardware elements he may need to integrate the different technologies. Gateways will be key to integrating older SDI products with newer IP solutions. Image: Media Links MDP 3020 IP Media Gateway Encoder & Decoder. The most commonly mentioned solution to integrating disparate equipment is through the use of a gateway. Are gateways going to be the black box or digital glue of the IP world? Never mind that there are still many flavors of IP while ST-2110 is being rolled out. Sony is staying with NMI and will gateway in and out. NewTek has NDI which is more like J2K than either ST-2110 or ASPEN. One of the other interesting topics in the transition to IP is the current standards are intended only for use inside the facility as transport. The ST-2110 standard is not intended for IP contribution and distribution links. It appears that J2K will continue to be the preferred IP format. Is this another gateway opportunity? We are not only at a major crossroad of transitioning from SDI to IP, we also have to respect the first adopters who invested in a technology that later may get pushed aside by another. Anyone remember the early digital wars with the argument of component versus composite and the early days of MPEG? The fact is the industry endured multiple generations of MPEG1 before we got to MPEG2 and even more changes before getting to SDI. All this is a reminder of the gyrations these pioneers endured to keep their facilities interoperable both backwards and forwards through the transition. The vendors and manufacturers need to help us through the coming transition with both knowledge and conversion products—for as long as needed. Let’s look at gateways. Will every device need a gateway? Are gateways going to be hardware or software or both? First-generation IP switch topology has been proprietary and the direction is supposedly moving to COTS (Commercial Off the Shelf) technology. That means needing either a gateway appliance or will the first generation products be given the ability to host the legacy and new formats? Manufacturers tell me they plan to rely on gateway appliances. In the IT industry, Software Defined Networking (SDN) removes the network brains from edge devices. As broadcasters embrace SDN, will SDN be able to navigate between the different IP formats? Does the potential for software middleware in the switches become an option? One of the decisions of the SMPTE ST-2110 suite was to let a separate group, the Advanced Media Workflow Association (AMWA) produce the discovery and registration specification that provides command and control for the SMPTE IP standard. Note that these are API’s and not separate elements in ST-2110 or essence that is multiplexed into the IP ecosystem. How will systems adopt the AMWA IS-0x specifications? Where exactly are these specifications implemented and will they be interoperable across formats? What happens to them in a gateway? What happens when IP formats are converted to J2K for long haul transmission? Are there allowances in the J2K stream for the IS-0x information? How will IS-0x be retro-implemented in first generation IP devices even as newer IP devices are added to a system? 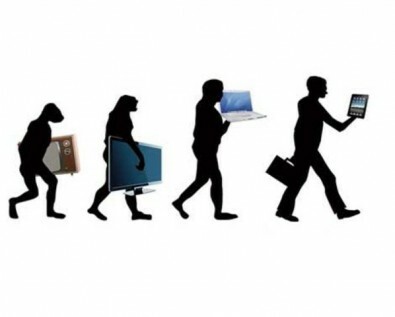 An evolving technology is a series of steps, rather than one giant leap. Successful wide-spread adoption takes time. Image: Timetoast. The transition to IP is more complicated than just throwing a switch and this has to be accomplished while supporting an operating hybrid facility. We could ask, will new IP products have the native flexibility to host more than one IP format? A similar issue resulted when the Grand Alliance produced multiple HD display standards. The upshot was a requirement that camera and production devices needed switches for all the formats. File-based production is reasonably mature. Even so, these devices are still required to manage multiple codecs, formats and containers. Facilities today find themselves having to deal with more, not fewer, formats as new “interoperable” master formats are introduced like IMF and MXF- Archive. As IP-centric broadcast and production technology matures, there will continue to be the need for glue-like solutions that address evolving format changes. Technology is ever changing and we can expect improvements to be added moving forward. Equipment buyers should expect a hybrid period where SDI equipment works with the newer IP-centric gear, even if that requires gateways. Today’s IP solutions will mature and become more stable, but there will be intermediate stops along the way. All of this means facility engineers need to remain flexible with their design requirements. Likewise, manufacturers need to be supportive with transitional devices and solutions—for as long as the transition takes. Just what is SMPTE ST-2110?